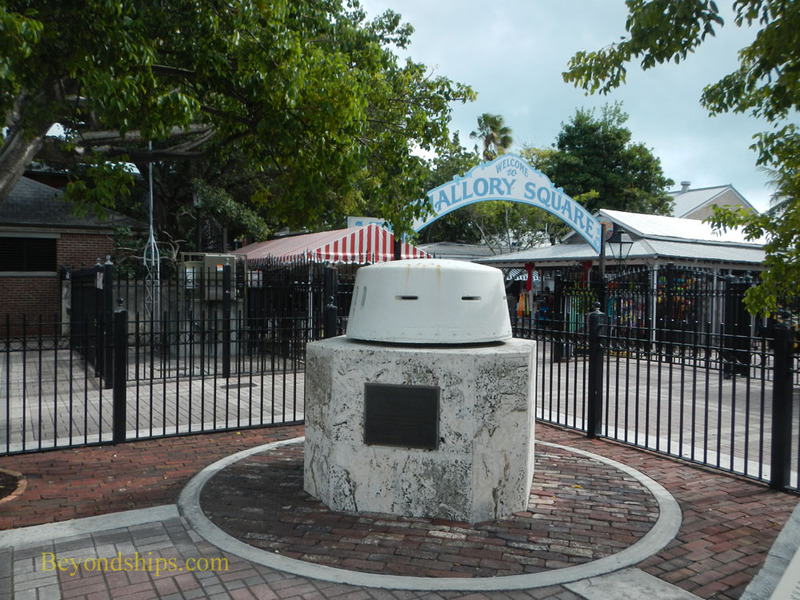 A sculpture garden contains busts of individuals important in Key West's history. 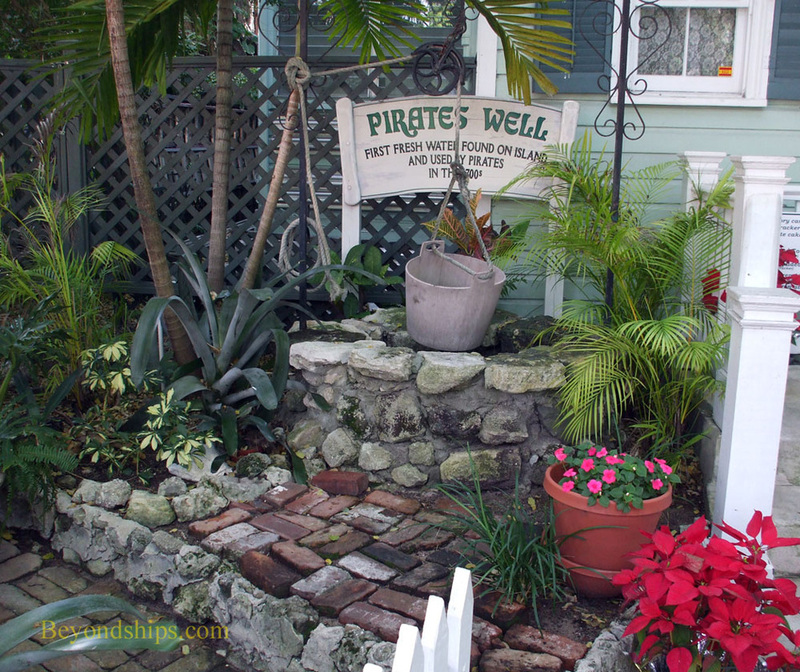 Above: A well that may have been the first source of well water on Key West. 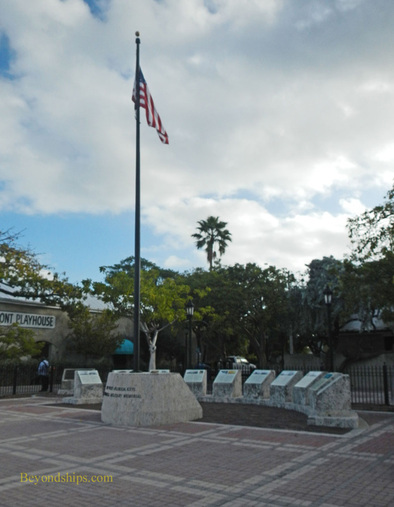 Above: The Key West - Florida Keys Military Memorial. Above: A turret salvaged from the battleship USS Maine recalls the connection between Key West and the ill-fated warship. 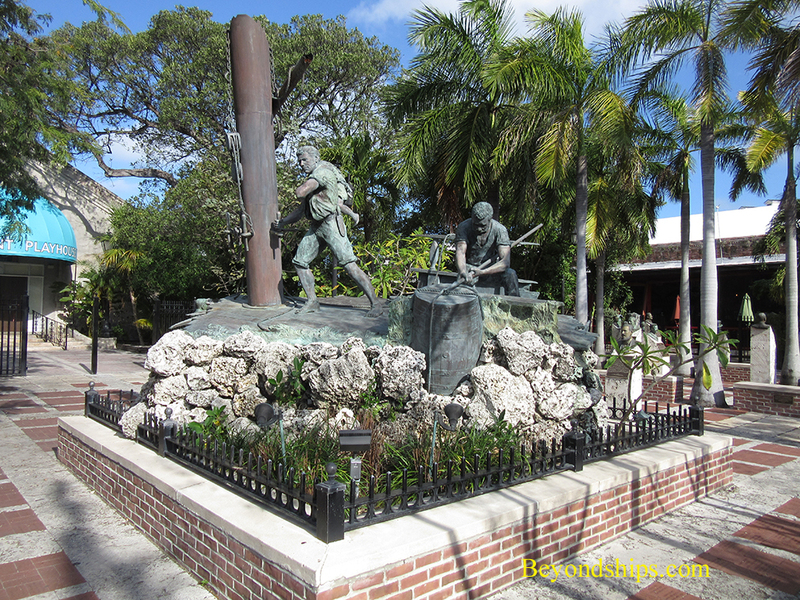 Below: A statue pays tribute to the individuals who salvaged ships, once an important industry in Key West. Above: A building displaying the Conch Republic flag. People have been enjoying Key West since before Columbus set sail to the New World. The Calusa people inhabited the island in those days and were there to greet the first ship-borne visitor, the Spanish explorer Juan Ponce de Leon. The Spanish called the island Cayo Hueso, a name that you still see used on Key West. 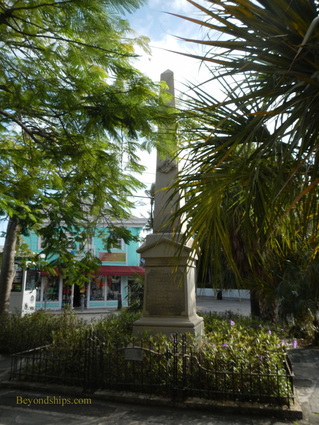 They evacuated Key West in 1763 when the British took control of Florida. Even though Spain regained control of Florida at the end of the American Revolution (Spain supported the Americans against Britain in that war), Spain did not re-occupy Key West. As a result, the island went through a period where there was no government and the island was home to pirates and the like. In 1822, Commander Matthew Perry of the U.S. Navy came to the island and claimed it for the United States. Since no other country objected, the Florida Keys became a part of the United States. Key West did have strategic significance, however. It has a deep water harbor and is located on the Florida Straits, an important shipping lane between the Atlantic and the Gulf of Mexico. Accordingly, the Navy established a base at Key West and in 1845, construction began on Fort Zachery Taylor, which would guard the base and the growing town. During this period, Key West was developing economically. Because of the reefs around the Florida Keys, there were many shipwrecks and so a lucrative salvage business grew on Key West. Sponge harvesting and fishing also were important. Towards the end of the century, cigar factories, like those in neighboring Cuba, sprang up in Key West. The Cuban community in Key West was actively involved in the Cuban independence movement leading up to the Spanish-American War. As tensions grew between Spain and the United States over Cuba, additional warships were stationed at Key West. This included the battleship Maine, the sinking of which in Havana harbor triggered the war. In fact, the Maine sortied from Key West on its final voyage and the inquiry into the sinking was held at Key West's Custom House. During the war, Key West was an important supply base. Key West for a time was the richest city in Florida but it did not become physically connected to the rest of the state until the Overseas Railway was completed in 1912. The railroad only lasted until 1935 when it was destroyed by a hurricane. In its place, the federal government built a highway. As a result, U.S. Route 1 now goes from Key West to Maine. The island attracted several well-known writers during the first half of the 20th century. These included Tennessee Williams, Robert Frost and Ernest Hemingway, who lived in Key West during the 1930s. Key West also attracted a number of 20th century American presidents beginning with William Howard Taft. The most frequent presidential visitor was Harry Truman, who made 11 visits during his presidency and several after he left office. When Florida seceded from the United States at the start of the Civil War, federal forces stationed at the Navy base and at Fort Zachery Taylor maintained control over Key West, preventing it from becoming part of the Confederacy. However, in 1982, Key West again attempted to secede declaring itself the Conch Republic. The U.S. Border Patrol had set up an immigration check point where U.S. Route 1 joins the mainland. This inconvenienced travelers and thus hurt Key West's tourist-dependent economy. Key West declared that if the island was going to be treated like a foreign country, it would become a foreign country and so declared its independence. It also immediately demanded foreign aid from the United States. The federal government declined to take this seriously and did not recognize Key West. Nonetheless, you still see the blue Conch Republic flag around Key West. Today, Key West has a population of about 25,000. It is a culturally diverse city with a significant gay and lesbian community. It remains an active Navy base, important in training naval aviators and in combating drug traffic. At the same time, it remains a magnet for tourists especially during Spring Break and Key West's various festivals such as the annual Fantasy Fest.